Ecology to consider allowing more water to spill over dams to help salmon migrate. 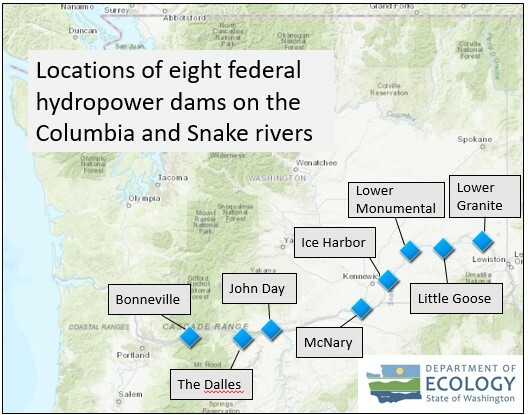 Spring spill season for dams along the Columbia and Snake rivers is approaching. During this time, generally from April through June, large amounts of runoff from the melting snowpack lead to high water flows. When hydropower operations cannot pass all of the water through turbines or store it, water is spilled over the dams through spill gates. 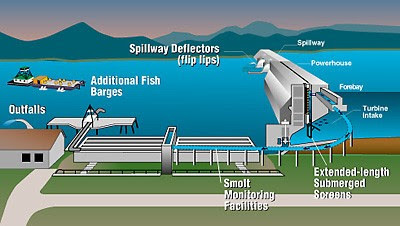 Spill is used to manage incoming water and to help move juvenile salmon past dams, downstream towards the ocean. During this time, upwards of 100 million juvenile salmon migrate down the Columbia River. Ecology, in support of the new agreement for flexible spill operations at four lower Columbia and four lower Snake River dams, is proposing a short-term modification that would allow more water to spill over the dams, with the goal of improving the survival of juvenile salmon migrating to the ocean. Under the flexible spill agreement, the increased spill would happen during hours of relatively low energy demand, balancing salmon survival rates while managing power costs. The short-term modification would apply to state Water Quality Standards, specifically the Total Dissolved Gas criteria. When water is released from spill gates at the top of the dam, the plunging water can trap air (mostly nitrogen and oxygen gas) in the water. This could pose a threat to aquatic organisms, such as the adult salmon who are migrating back upstream and resident fish including white sturgeon or mountain whitefish. In this situation, fish are susceptible to ‘gas bubble trauma’ or what you could call giving fish ‘the bends’, if you are familiar with the scuba diving term. Currently, the total dissolved gas criteria is 110% for Washington State. 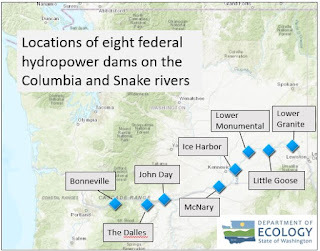 There is a special condition to aid fish passage past dams during the spill season for the Columbia and Snake rivers, allowing total dissolved gas levels of 115% in the forebay, 120% in the tailrace of dams, and a maximum one-hour average of 125%. Spilling water over dams is recognized as one of the best ways to protect fish as they move past dams. The Department of Fish and Wildlife and the Columbia River Inter-Tribal Fish Commission and a coalition of Northwest Sportfishing Industry Association, Columbia Riverkeeper, and Save Our Wild Salmon have requested Ecology remove the 115% forebay criterion for total dissolved gas for the 2019 spring spill season and maintain the 120% tailrace criterion in the Columbia and Snake rivers. 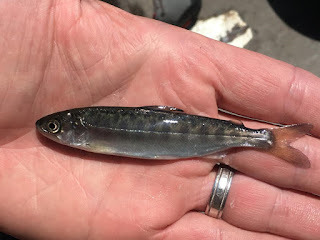 The purpose for removing the 115% forebay criterion is to test the benefits of more spill on fish passage by allowing higher total dissolved gas levels. This would align with the flexible spill operations agreement. The goal of the short-term modification is to understand if allowing more spill will improve the survival of juvenile salmon migrating to the ocean without too great of impact on salmon, resident fish, invertebrates and other aquatic life in the rivers. At this time, we are considering a short-term modification that would remove the 115% forebay criterion for up to three years. This action would coincide with the flexible spill agreement that aims to benefit salmon and hydropower. In order to do a short-term modification to our Water Quality Standards, we must complete an Environmental Impact Statement. Drafts of our Environmental Impact Statement and short-term modification are now available for public comment. The Environmental Impact Statement, while technical in nature, provides extensive information on current available science, research, and data related to total dissolved gas. It also contains a discussion of potential alternatives for developing a short-term modification. We are planning two public hearings that will begin with a short presentation, followed by questions and answers. The hearing portion will begin shortly after the questions and answers are finished. During the hearing, you may give oral testimony and written comments. Written comments will receive the same consideration as oral testimony. Feb. 13, 2019: In-person in Vancouver, WA at 2:30 p.m.
After reviewing the comments, we will release our final Environmental Impact Statement and make a decision on issuing the short-term modification. To learn more about Ecology's actions to support orca and salmon recovery, visit our Orca task force webpage.